As the world’s leading designer of high-quality, professional spray equipment, Anest Iwata is constantly inspired to evolve already superior products and make them even better. 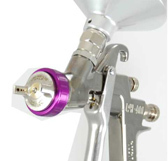 The Anest Iwata product range includes several spray guns, pumps and accessories that, based on their specifications, are useful during different painting phases and in different application fields and that can consequently satisfy any need. The product range also offers users the perfect balance between the use of energy and the effect of the use of energy: in this way, those who choose Anest Iwata become participants in a responsible process for preserving and ameliorating the world around us.